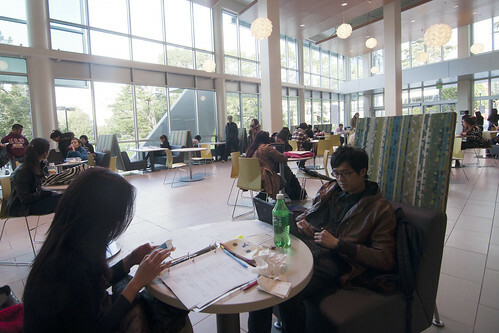 Business major Wing Yeung (right) studies in the newly opened J. Paul Leonard and Sutro Library on Jan. 23. The library opened its first floor on Monday. Photo by Gregory Moreno. The J. Paul Leonard and Sutro Library, arguably the biggest and most highly anticipated campus revamping in the past four years, is taking the smallest steps in fully revealing itself to the public this week. Although the building officially opened along with other classroom doors at the beginning of the semester Monday, the only accessible area was the west side of the first floor, offering students a quiet space to study and a pickup and checkout desk for library books. Under construction since the demolition of the former J. Paul Leonard Library in fall 2008, the new development will be reopened “portions at a time,” according to University spokeswoman Ellen Griffin. Currently, this work includes furniture delivery and installation, paving the east side entrance of the library and completing the transfer of books from the pseudo-library at HSS to the new building, according to a project presentation prepared by Masters and Director of Academic Technology Maggie Beers. But despite the ongoing transition, the new library is complete enough to offer students an expedited book request process. This is because of the Library Retrieval System, a cutting-edge addition to the building. The LRS is a densely packed book storage facility located on the top two floors of the library. It features a robotic crane that finds and delivers requested items to staff members on the lower level, who then distribute them to students. Cal State Northridge, Sonoma State University and Cal State Long Beach are the only other CSUs equipped with a LRS. Masters said that while some members of the University administration would like to unveil the new library with a ceremonial grand opening, that probably won’t happen until midway through the semester. “We’re trying to have everything open by the time students return from spring recess,” Masters added. When the library is ready for full admission, students and faculty can expect a number of improvements from both the former J. Paul Leonard Library and the stand-in Annex I. “Once it is fully opened, it will include 50 percent more seating, 300 percent more group study rooms and twice as many computers than the original library, plus a cafe and a 24-hour research commons,” Griffin said. She added that throughout the staged opening, the Annex I will maintain its round-the-clock hours. While most current students have only a faint recollection of the original J. Paul Leonard Library, some, like Antonio Taylor, are familiar with all three libraries. Taylor said he plans to embrace the new library with open arms, and is particularly intrigued by its contemporary interior. Students can track the progress of these staged openings on the Leonard Library Spotlight Blog web site.